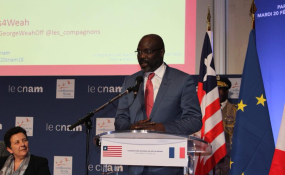 Monrovia — President George Weah has gone roughly six months into his tenure with much attention being drawn to his commitment of his first 100-day deliverables as well as campaign promises, which a renowned Liberian lawyer, Cllr. T. Negbalee Werner, has named as a moral and legal obligation of Mr. Weah. "Campaign promises are rampant features of Liberia electioneering. The most striking issue is that they are made by politicians without meaningful flagship to deliver on these promises. I suggest to you on the contrary that campaign promises are not empty thoughts. They are morally and legally enforceable," Werner said. But Werner believes the approach of the Presidential Meter Project is an important accountability mechanism that draws the attention of the public to key features of Liberia's political activities which pose a challenge of focus on campaign promises made with little or no intent to honor them. "Agreements are made to be enforced, whether it's in commercial transaction, or diplomatic relations. Some of these relationships are broken but what is required is that one must come out and hold the promisor to account. Liberians have the right to call on anyone who made campaign promises to them," Cllr. Werner stated. "The data will be used to inform government that 'Hey, you promised the 14 Military Hospital and we haven't seen that; you promised the Bailey Island to be transformed into the new Monrovia, we have not seen that. But on the contrary what we are seeing is the reversal against the gains that were made,'" Ali asserted. Giving an overview of the project, Naymote Executive Director Eddie Jarwolo said the President Meter Project under the caption "Weah's Meter," is designed to ensure democratic accountability by documenting, monitoring and tracking government's progress in the implementation of campaign and governance promises. As a way of smoothly implementing this venture, Naymote said it has identified and quantified 66 promises from the Coalition for Democratic Change's manifesto and 20 promises from speeches and other sources made by President George Weah after his induction. "During the project, NAYMOTE will host series of town hall meetings to share updates on promises documented, produce citizens' report cards on the government's performance, conduct national stakeholders' dialogues on the status of the campaign promises achieved, ongoing and not started as well as develop policy to be shared through various media outlets and with various stakeholders," Jarwolo noted. Meanwhile, Jarwolo stated that the President Meter is a flagship intervention of OSIWA's political governance and democratic consolidation program and marks the seventh of such initiatives sponsored by OSIWA in the sub-region.